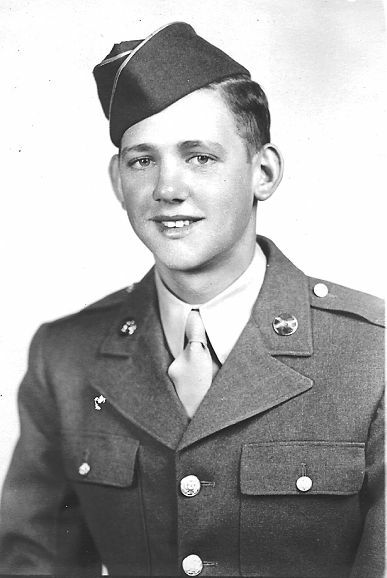 Jimmie, one of Conrad Adam’s great grandsons, served in the US Army during World War II. He originally trained as a motorcylist and was ready to ship out to Europe when last minute orders sent his unit to Colorado to be trained as infantry soldiers. After training, the unit was sent to San Francisco where they boarded a ship to an unknown destination. It wasn’t until they were out at sea that they were told they were going to the Philippines. During the voyage they ran into a storm. The waves were so strong and violent that it would lift the ship so high out of the water that the propeller was exposed. Jimmie saw action in Leyte, Mindoro and Mindanao and later was part of the occupation army in Yokohama, Japan. One story he has often told is while in the Philippines he was very hungry and he wrote home and told his mother, Lillie, that he was hungry for her cooking especially sausage, cookies and a cake. She received the letter and started to prepare a care package for him. There was a cannery in Boerne during WWII and there she canned sausage she had made and other food items. She baked cookies and a cake and added them to the package. Then she shipped it to him and amazingly the package made it to Jimmie, a little squashed but the food was edible. He said nothing ever tasted as good as the food in that care package. He said he ate bite every down to the last crumb! Adam, Jimmie. World War II, 1945. Photograph of the original held by Jimmie Adam. Digital copy privately held by Kathryn Adam-Hurst. Boerne.